The U.N. Commission of Inquiry on Syria has gathered enough evidence for Bashar al-Assad to be convicted of war crimes, a prominent member of the commission, Carla del Ponte, said in remarks published on Sunday. Del Ponte, 70, who prosecuted war crimes in Rwanda and former Yugoslavia, announced last week that she was stepping down from her role in frustration at the U.N. Security Council's failure to continue the commission's work by setting up a special tribunal for Syria that could try alleged war criminals. She has not said when she will leave her post. The Syrian government led by Assad denies reports by the commission documenting widespread war crimes committed by government-backed forces and Syria's security services. 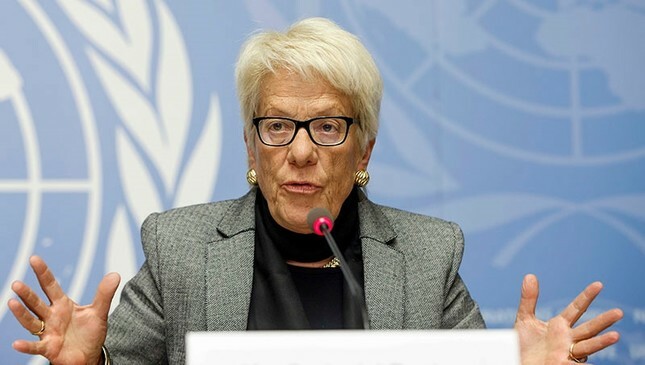 Del Ponte, a former Swiss attorney general, joined the three-member Syria inquiry in September 2012, chronicling incidents such as chemical weapons attacks, a genocide against Iraq's Yazidi population, siege tactics, and the bombing of aid convoys. Although the United Nations is setting up a new body to prepare prosecutions, there is no sign of any court being established to try war crimes committed in the six-and-a-half year-old war. Nor is there any intention by the U.N. Security Council to refer the situation to the International Criminal Court in the Hague. "For six years, the commission has investigated. Now a prosecutor should continue our work and bring the war criminals before a special court. But that is exactly what Russia is blocking with its veto in the U.N. Security Council," del Ponte was quoted as saying. Russia, a close ally of Assad's government, has a veto on the Security Council as one of its five permanent members. Asked which of the parties to the conflict the commission had primarily investigated, she said: "They all committed war crimes. Therefore we investigated all of them."